Andi and I have fled to Ann Arbor to avoid Eastport’s usual April mud. But it looks like the mud there is still covered. While we are away, we have network cameras keeping their eyes on things. We also have a guard fox. 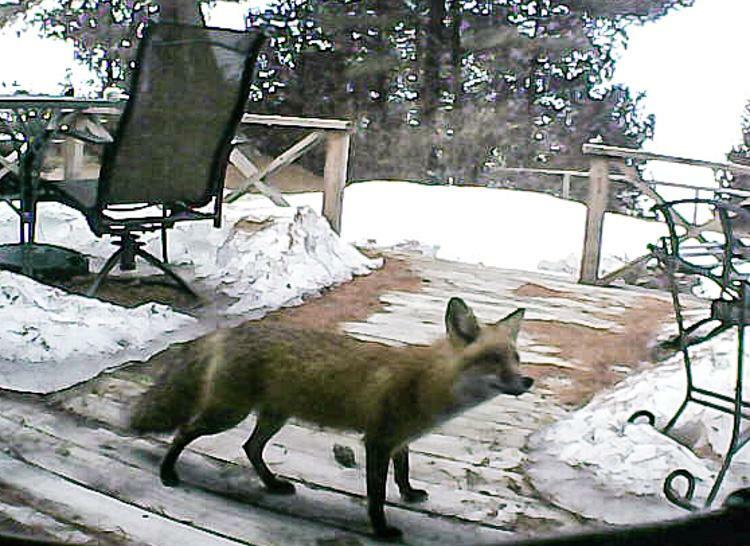 One of the network cameras showed the guard fox on patrol today. And to think that all I have for security is a pair of disreputable dogs. Coincidentally, while the fox was guarding the weather station, Miss Sadie, the Cowboy and I were down on the beach looking for hope. We looked south and found neverending winter. 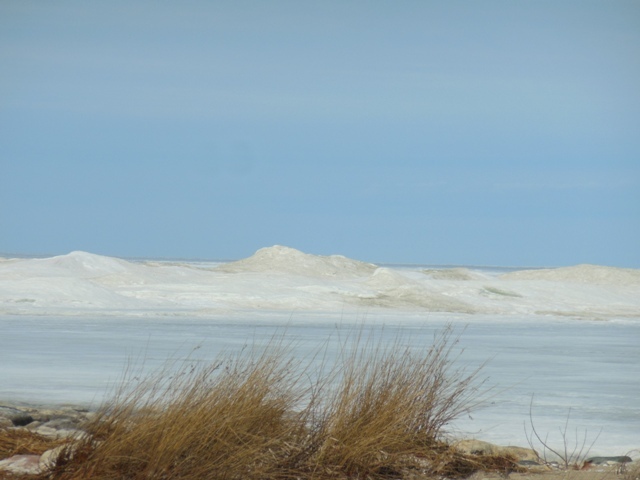 We looked to the west and found lingering ice mountains beyond the beach grass. 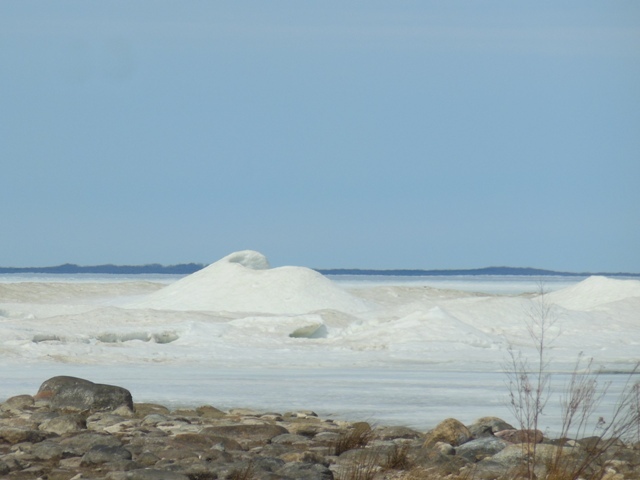 An ice volcano loomed off the rocky point where the gulls will gather soon. As you can see, blessed bare ground has begun to make an appearance in the neighborhood. 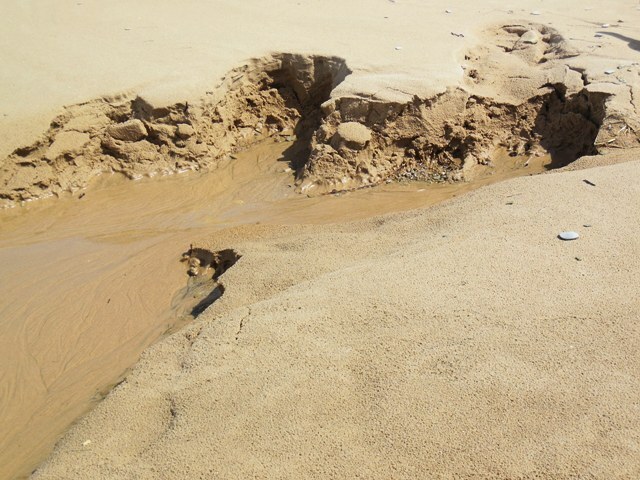 Sand emerges along the edges. Ice recedes. 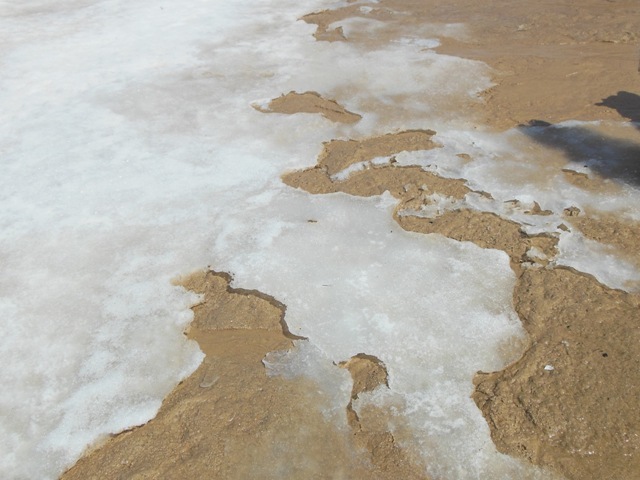 Snowmelt from the bluff wears gullies across the beach. It seems like the end of the great glaciers in miniature. By and large, we choose to be hopeful. In a burst of excessive optimism, some neighbors with a nice sheltered southern exposure brought out the beach furniture . 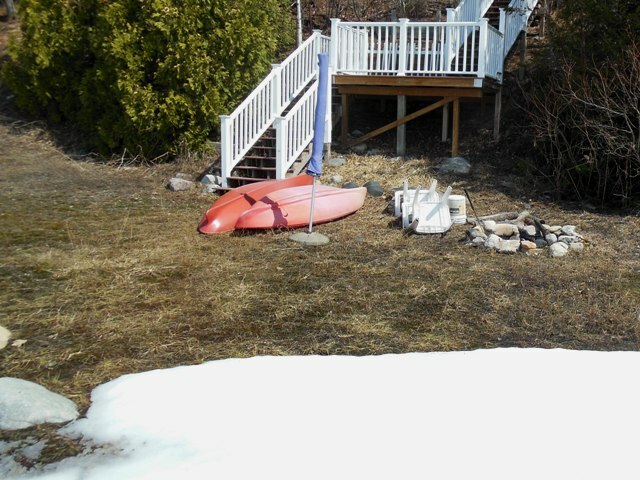 . . although now that I think of it, perhaps the kayaks and the chairs and even the beach umbrella have been buried under the snow until this week. Who would have known? Even at the Writing Studio and Bait Shop things are looking up. Blue Jays are pecking through the duff on the bare patches on the hill behind us. Pileated woodpeckers are at work in the trees. One day soon the beach pond will fill up and frogs will hide out under the boardwalk. The ice is melting. 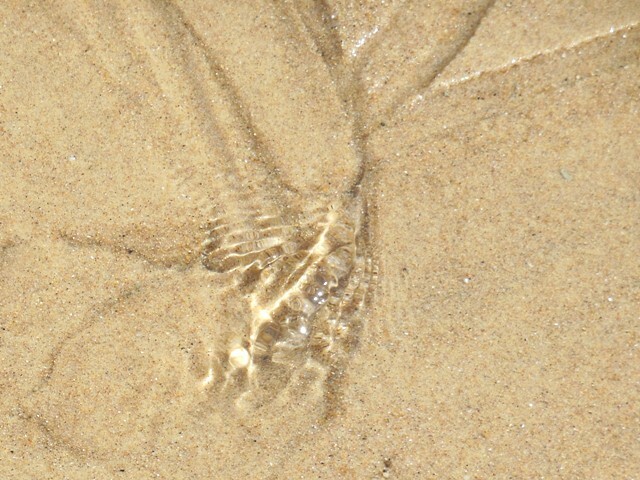 Blessed liquid water is playing in the sand. My favorite is the photo of your dogs. They look winter-worn, themselves. We heave and sigh and groan, but there’s just no question that the critters are happy when life gets a little easier, too. I like the photo of the ice and sand, too. I always liked the way some ice would seem to melt away from the bottom up, and you could make it sound like thin glass breaking if you hit it just right. 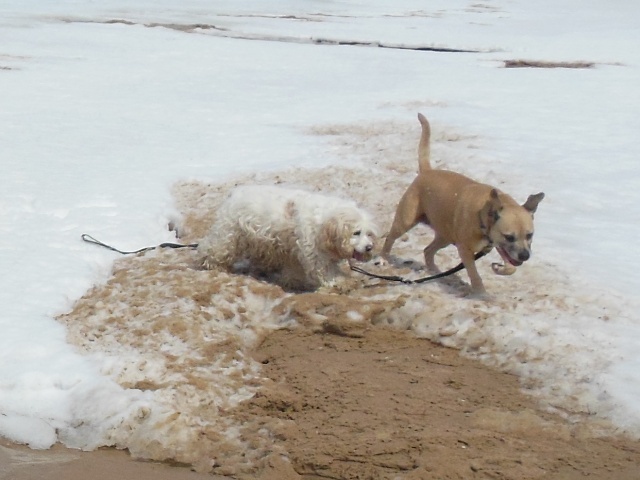 The dogs love fluffy snow and packy snow that isn’t too deep, but they are well and truly tired of snow that threatens to bury them. I think they call it quicksnow, but maybe they are just woofing @#$%^. I enjoy pondering the various states of snow and ice myself. But it is time for spring break(up). Ah, yes, let’s concentrate on unfrozen H2O today and not think about snow predicted for Monday! By the way, what is it with all these Up North Bruces? In my life, there is Bookstore Bruce, Farmer Bruce, and Restaurant Bruce. I love your disappearing glaciers. Hate to lose the big, real, faraway ones, but the ones here can be gone any day, as far as I’m concerned. I am not going to address the alleged weather forecast, no indeed. As for the Bruces, I think it may have something to do with the vast numbers of Scots who settled Around Here, either directly or via Canada or the eastern states, in the 1870s and 1880s. Unless it’s something else, in which case I have no explanation at all. I have a theory about the glaciers. 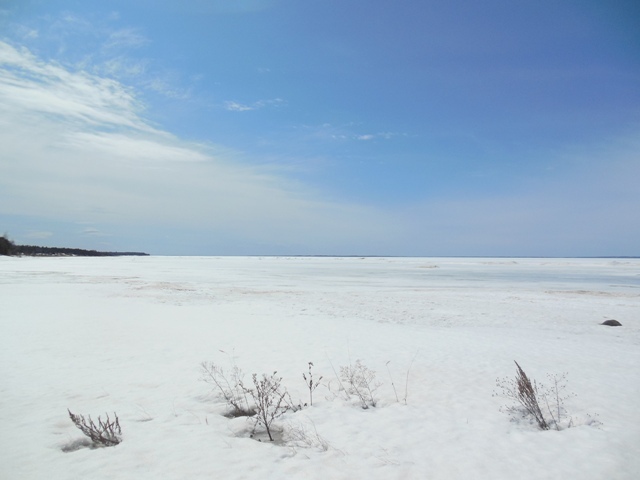 After this winter, I’m half convinced that the North Pole is melting so fast that it’s sliding down the great ball of Earth like a dripping ice cream cone. Pretty soon we’ll have Polar Bears in the neighborhood. I hope they eat skunks. Your snow has certainly lasted for a very long time. I admire the cheery fortitude with which you have gone through winter and hope you are rewarded with a glorious spring. It has been very persistent, hasn’t it! But it’s disappearing now. At least until later in the month when we may have a curtain call. I am glad I have been able to project cheery fortitude online while sniveling under the comforter in the Real World. A little cheerful prose can mask a world of pain. That is quite true. It can even diminish oh, say, a village of pain. Not the whole world, but a village is not to be sneezed at. I can’t believe how snowy you are! That makes me feel very “down south” indeed. I hope you get some warm rain now to help you out of this mess! I liked Bruce’s fox too. It looks very healthy, which is nice. I think it was a very hard winter for all animals, including me. Our snow is melting fast, although it lingers in shady spots in the woods and on the north sides of hills and ridges. Today is misty and fairly warm . . . but it’s supposed to get colder and turn to @#$% tomorrow. Not much. Just enough to make us mad. Of course my favorite shot is the one of Cowboy and Miss Sadie, so nice to see them, but that fox is pretty cool, and I love the liquid water too. We had a lovely day yesterday, then a very dangerous stormy night that husband and I missed because we were out of town. Katie told us all about it when we got home, for several hours she told us. We were lucky, the really bad stuff went slightly north. Miss Sadie and the Cowboy are gratified. I’m glad you liked the cool fox – and I confess that the liquid water was a pet of mine, and I’m unreasonably pleased to have it mentioned. You did have a lot of Weather down there. I’m glad you are all well. Poor Katie, probably hiding under the bed until she heard the car in the drive. My condolences on the snow. A pox upon it ! Love the Fox photo ! Another vote for the fox! Such a pretty fox. The snow is looking a bit poxy. I’m pretty sure it’s dying. I must confess that seeing a fox in the garden has more appeal for me than watching dials and graphs – although if the dials and graphs show quantities of homemade electricity they’ll be pretty appealing too. I wish for plenty of sunshine for all of us. This just came to my inbox from Winnepeg, and of all the people I know who might appreciate it, you and your winter-weary readers might be at the top of the list. It’s a song, but – what a song. You’ll see. They get serious about winter-weariness in Winnepeg. I am intrigued. I will have to get to broadband. Just got back from a walk into the salt marsh. Winter coat on… with mitts… car needed scraping…. boardwalk slippery from so much frost… God alone knows when Spring will finally arrive. And stay. It occurs to me that the ways we personify Spring are all wrong. That sprite dressed in diaphanous pastels dancing across buttercup-strewn grass has nothing at all to do with real spring. Real spring is mud season, a test of our courage or resolve or just plain cussed stubbornness. I’m going to give this more thought, but I think I’m onto something here. And definitely stubborn. Oh my. I studied all the fairies. They scared me. I’m going to take my own little Pookas for a walk.